During Lent, the entire family does not eat meat on Fridays. If for some reason my husband is eating by himself (lunch), he is ambivalent about whether he eats meat or not. :) If he's feeling like a ham sandwich, he'll have one. But we plan meatless dinners. At his Catholic school, Henry always receives a meatless lunch if he's buying, which is nice. If he's packing, either Mike or I will pack him something that doesn't include meat. Henry and I read saint stories before he goes to bed, this has become our tradition. Last Lent, I bought him a very nice rosary and we would pray a decade before he went to sleep. I'd like to do this again, or otherwise incorporate in a real prayer time with him for Lent. I know that he will be resistant to this. He seems embarrassed to pray in front of me. He's a shy kid, just like I was, and I think that it's difficult for him to let his guard down and do something aloud that is private for him. I'll talk to him about it, and we'll come up with a plan. But during the major liturgical seasons of Advent and Lent, I think things to feel "different", it's not just same old, same old in terms of our routine. Henry is a routine oriented person (the apple doesn't fall far from the tree...) and it's good to have that reminder that "oh, I'm going to do this now/not do that, because it's Lent." It would be lovely to include Anne in this for a family rosary, but I'm going to be honest, dear reader: the thought of trying to wrangle my very active two year old into sitting still for even more than three Hail Mary's sounds like a near occasion of sin for me and my mental health. :0 Next year may be different, but this year I'm going to give her a pass. I know that last year, Henry gave something up for Lent, although I cannot remember what. (my mind: I miss it SO MUCH...) I'm going to encourage him to think about this again this year and choose something to either give up, or add into his routine as a prayerful or charitable thing for Lent. Oh wait!! Sometimes there is still hope for my memory, whew! He chose to read his children's Bible during Lent last year, it was adorable. He got through the entire thing, although he went with an edition that is really below his reading level, so it didn't take him very long. I'll talk to him about it again this year. At school, the children are also encouraged in such Lenten practices, which is good reinforcement. Well. Dance class is something in my life that I treasure, that is a creative outlet for me, that is a source of happy and healthy socialization for this shy soul, and that is a fun form of physical fitness. Giving it up really wrecks havoc for me. What I did last year was buy Henry a book of children's Stations of the Cross, and we read them and prayed them together over the course of a few nights each week. I plan to do that again. As well, with him making his First Communion this coming May (so excited!) I'd like to take him to adoration with me once this Lent. I think that is a manageable goal, and I'm all about making my goals *manageable*. :) I want him to really understand what we believe about the Eucharist before making his First Communion, and I think adoration is a powerful way to form that impression. Sunday Mass is not optional in my household, so me and the kids will be attending weekly throughout Lent, as well as on Ash Wednesday. Henry will get ashes at school, but I will take Anne with me next Wednesday. I'm also planning on going to confession at least once this Lent, and I will bring Henry along with me (who does seem to enjoy the novelty of confession still :)). This was a real coup last year. I didn't make it to Mass on Holy Thursday (and unfortunately I won't again this year, I believe I'm on the evening reference shift that night :( ) but I took Good Friday off from work, and I actually toted Anne along with me to church. I can't imagine where I got the courage from to do that, but I did. And she was *excellent*. Now, the thing is, I have learned my lesson on this front with kids in church. It's just like what my dance teacher says about dancing with a silk veil: just when you think you have things under control and have it trained, wham! They embarrass you in public. It's true with children, no?! She may have gotten a gold star last year, but this year she could strip her clothes off and run naked down the aisle during the veneration of the crucifix, YOU KNOW IT COULD HAPPEN. But I'm willing to try again, I enjoyed it so much. Good Friday is not a short liturgy, but it wasn't outrageously long. I've already taken the day off, and I'm planning to attend, Anne in tow. And so, those are my plans. 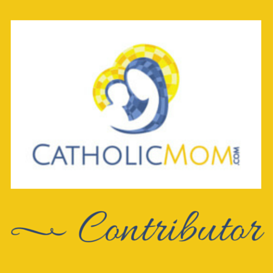 Do you have plans for your children during Lent? Leave me a comment! 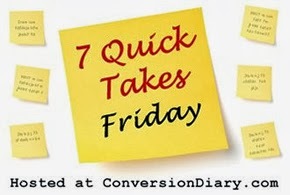 Check out other Quick Takes today over at Conversion Diary!